Laslett John Pott, born and raised in Nottinghamshire, specialized in historical paintings set in the 16th through the 19th century, many chronicling Napoleon’s bloodstained battles. Catering to the preferences of the middlebrow Victorians, he also painted emotionally laden narratives and sentimental scenes from classical English literature. From 1860 to 1897, Pott exhibited an impressive 43 works at the Royal Academy of Arts. Some of his most famous paintings are: Mary Queen of Scots on Her Way to Her Execution, Charles I After His Trial, and On the March from Moscow. Disinherited was exhibited at the Royal Academy in 1884. Pott expressed a passion for painting and displayed extraordinary talent at a very young age. However, Pott’s father insisted that his son pursue a career in architecture and forced him to become an apprentice to a local architect at the age of sixteen. Bored of columns and corbels, the younger Pott eventually persuaded his father to enroll him at a well-known art school in Bloomsbury, London. A few years later, Pott became a student of Alexander Johnstone (1815 – 1891), a Scottish history and genre painter. While training in Johnstone’s studio, Pott produced his first paintings accepted for exhibition at the Royal Academy. Almost instantly Pott won the respect and admiration of the top professional art critics, as well as the general public. When he was only 26 year old, Pott’s painting, Puss in Boots, was selected to hang “on the line” at the 1863 Royal Academy Exhibition – a huge honor, since many paintings were hung too high or too low to be viewed properly. The next year, Pott’s Rebecca describes the Fight to Ivanhoe was exhibited at the Academy, followed by Old Memories in 1865. Pott continued to exhibit at the Royal Academy throughout his career, and was often praised by the critics at the Art Journal for both his sentiment and skill. His painting called On the March from Moscow (1873), an image of Napoleon’s defeated and downtrodden army during his disastrous invasion of Russia in 1812, was thought to be one of his most impressive and emotive compositions. Another subject from France’s dismal history appeared at the Academy in 1874; the painting, Paris, 1793, depicts two victims on their way to the guillotine. 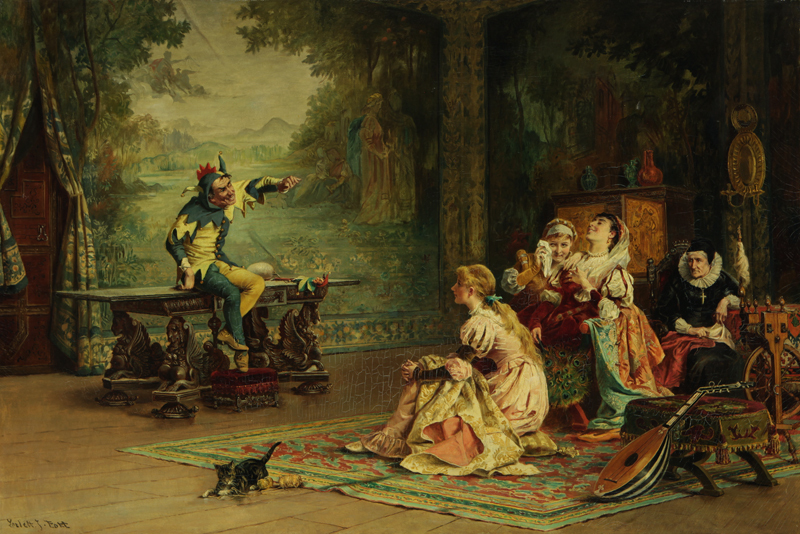 Although Pott was clearly drawn to the tragedy of war and the dark side of human life, he sent several paintings to the Academy that were more joyous in nature; Don Quixote at the Ball (1875) and The Jester’s Story (1891) are two of his more humorous and romantic compositions.